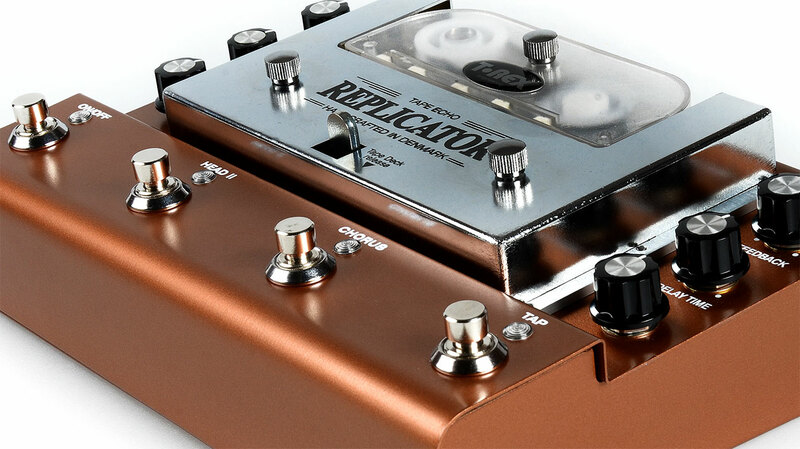 First unveiled as a prototype version at the 2015 NAMM Show, the first production units of this made-in-Denmark pedal are now available. 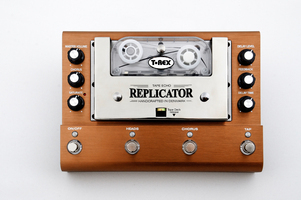 Replicator aims at pairing the sonic qualities of a pure analog tape echo with modern features - some of them announced as unique on a tape delay. 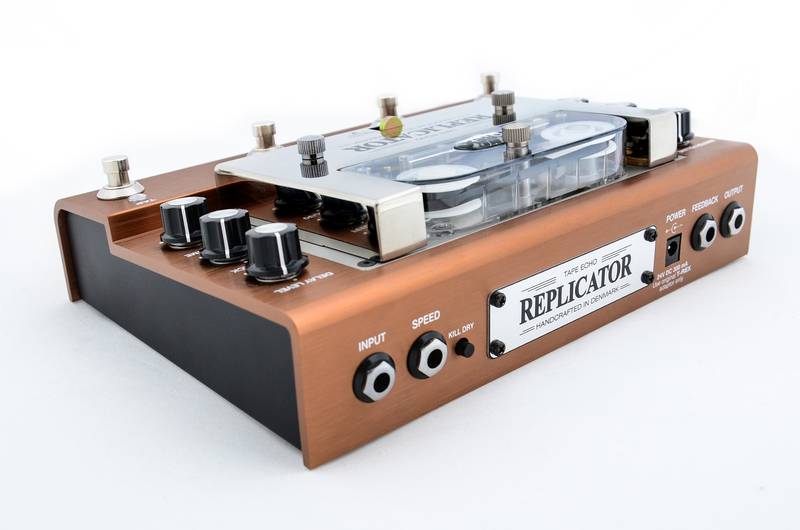 Hence, the Replicator is announced as the first analog tape delay to feature a Tap Tempo footswitch, allowing users to easily adjust delay time on the fly. Two playback heads mounted at different distances from the record head offer a wide range of delay time going from 125ms to 1200ms - giving users a wide range of possibilities going from quick slapback to long, ethereal repeats. Head 1 is used for longer delay, while Head 2 handles shorter repeats ; both heads can also be used in tandem for a unique rhythmic feel. 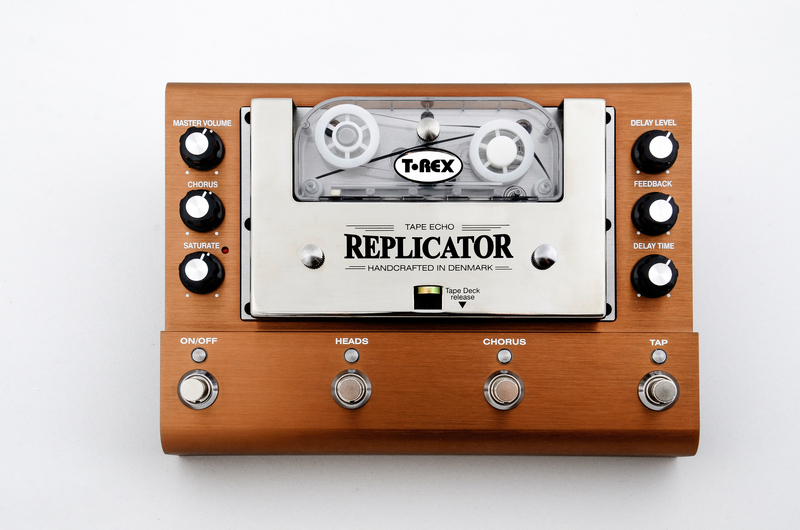 A Chorus control gives users the possibility to vary the tape speed in very small amounts so as to provide pitch modulation of the delays. The Replicator also features adjustable Master Volume and Saturation controls, plus standard delay controls (Delay Level, Feedback, and Delay Time). A "Kill Dry" switch provides one-touch elimination of the dry signal - a useful option when used in effect loops. 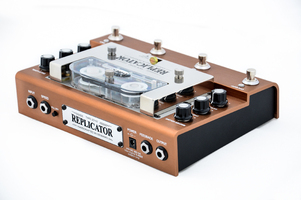 Two expression pedal inputs allow the player to control Delay Time and/or Feedback via an expression pedal (not included). The circuit is also said to feature a high headroom, making the pedal quitable for processing line level signals as well (keyboards, P.A. aux sends, preamps, etc.). 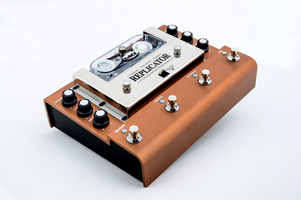 Replicator uses a proprietary tape cartridge which features 1/8" tape made in Germany by BASF. Replacing the cassette is said to be partularly easy and quick, and replacement cartridges are to be sold separately for a $30.00 MSRP. 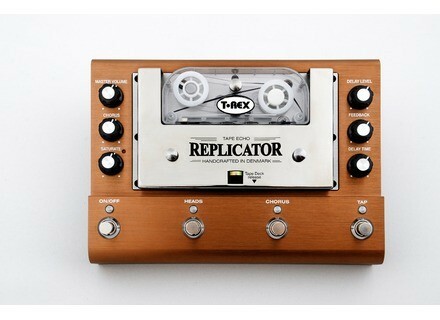 The T-Rex Replicator is available now at T-Rex dealers worldwide. More details available at the manufacturer's website. Allen & Heath adds new models to ZEDi Range Following the recent launch of the ZEDi-8 hybrid mixer/interface, Allen&Heath has released two more ZEDi models, the ZEDi-10 and ZEDi-10FX. Meyer Sound Amie now shipping Meyer Sound announces the availability of their Amie precision studio monitor.